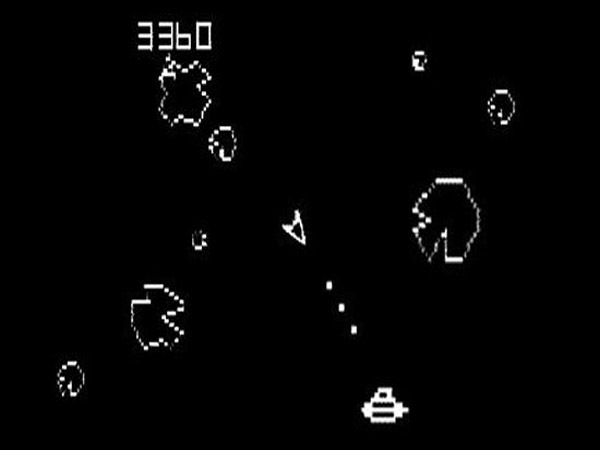 Ah, Asteroids. As retro gaming celebrities go, this guy is right up there. You’ll see him at swanky game-y cocktail parties, entertaining his groupies alongside Space Invaders and Pac-Man and other such A listers. These are the retro games, and they demand your attention. Which is why I’m typing words at your face regarding Asteroids right now. So buckle up, because here come some more. This arcade classic was released way back in 1979 by Atari. It’s credited as one of the games which kick-started the Golden Age of Arcade Games (which is an actual thing, a fancy title complete with capital letters and everything), which is a huge deal for a humble and simplistic shooter. Let’s take a look. The premise is easy enough to grasp. You are the pilot of a tiny triangular spacecraft, trapped in the middle of an asteroid belt. Not relishing the prospect of a miniature fiery death, your objective is to blast the rocks flying around your ears and survive for a long as possible. Unable to ‘escape,’ the whole thing’s just one survival mode. You control your craft by means of that awkwardy turn-y go-y system we all know so well. It will have to be mastered, as only the deftest of pilots find their way onto the leaderboards. 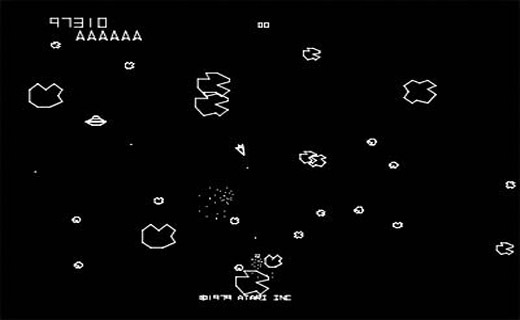 Asteroids is certainly punishing, as a simple slip or unexpected collision will spell your doom. Health bars? Shields? There was none of that newfangled business in 1979. You don’t pass go. You don’t collect $200. You just explode. If you’ve ever utilised hyperspace mode and cried a little as it materialised you right in a asteroid’s darn face, you’ll know how cheeky the game can be. But more important than that is how successful and influential it was. Defender, Space Invaders and the like were all cut from the same cloth, and hold all of the virtues of early gaming: accessible, instant fun, which was as addictive as it was deceptively challenging.